On our first visit to the 18 year-old Senso Ristorante & Bar at Club Street, we were so disappointed by the food that we forewent writing a review. But we returned for their Sunday Prosecco Brunch, and it is much better. The buffet brunch starts from $68++ (includes free-flow of juices). An additional $30+ gives free-flow of prosecco from Fratelli Bortolin; additional $40, free-flow of prosecco, wines, beer, soft drinks, and coffee and tea; and additional $60 gives everything previously mentioned with Veuve Pelletier champagne. The buffet table displays some quality antipasti, which include cold cuts (aged parma ham, mortadella, salami, breasola), vitello tonnato, beef carpaccio, prawns, freshy shucked Fin de Claire oysters, freshly baked breads, salads (chicken salad, beef salad, carrot-raisin salad, potato salad, pesto salad, etc), and a selection of cheese (gorgonzola dolce, fontina, etc). The selection is quite impressive and is already worth the money. Tastewise, most of them are satisfactory. Besides the antipasti table, you can also order food that is cooked a la minute. They have the usual Italian sections–appetiser/soup, pasta, mains, and desserts—but you may have to pay extra for them. It is definitely worth the money to pay an additional $8 (per serving) for the pan-seared duck liver, thick and huge as a fat baby’s palm. It’s cooked excellently, still buttery inside, and is paired intelligently with port wine cherry coulis, salted meringue, and dry apricot-pistachio crumbs. Salted meringue!? Have you ever eaten it? The tart cherry coulis serves to undercut the fattiness of the liver; quite tasty. The foie gras terrine (additional $8 per serving) is also as fantastic as the duck liver. The buttery brioche complements but doesn’t add to the fattiness of the terrine. Mango chutney lifts up the dish. From the pasta section, the lobster ravioli comes in a earthy saffron sauce that doesn’t overpower the sweetness of the seafood. 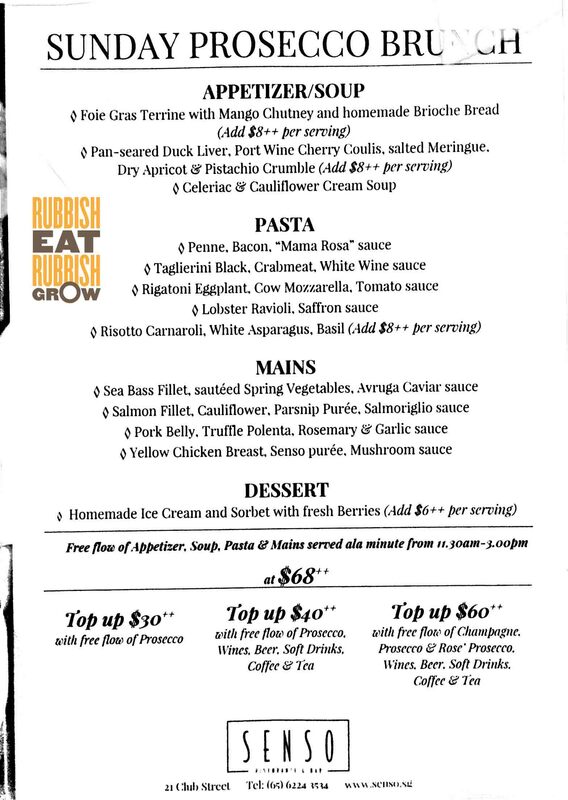 Not sure why there is an additional $8 per serving charge to the risotto carnaroli with white aspargus. It is okay but too heavy for a brunch that is already loaded with much food. You may want to skip this one. Even though the concept of the mains is mostly smart, there is a dip in standards in this section. Both mains are slightly over-cooked and hard. Although a little dry, the seabass fillet comes with a delicious Avruga caviar sauce. Similarly, the pork belly is just a tad over-cooked and hard, and similarly, the pairing is smart. It sits on a very tasty truffle polenta. On the dessert buffet table lie passionfruit tarts, dark chocolate, tiramisu, mango mousse, red velvet cake, cut fruits, etc. But this seems to be their weak point; we tried all their desserts and none is up to par. If you can splurge and spend additional $6 on their homemade ice creams and sorbets, you should. The sourish and refreshing passionfruit sorbet on berries remind us greatly of summer in Europe. Senso’s Sunday Prosecco Brunch is quite satisfactory and definitely gives you a bang for your buck. I recommend it.